Like most young kids, I grew up playing sports like basketball, softball and also was a cheerleader. I loved the team environment and truly thrived in working alongside other determined people. Through my experiences I found that I have a passion for helping people. Whether it’s through fitness , nutrition or just plain out living their best life! I truly enjoy being a guide for those who are looking to better themselves and obtain a healthier, happier lifestyle. CrossFit has been a huge part of my life and through it I have met some amazing people and built incredible relationships beyond my furthest dreams. The fitness journeys I get to be a part is not just something that I do , but truly a lifestyle that I am committed to helping people achieve with a smile on our faces! ​I found Crossfit as just another form of working out. I grew tired of chest and tri's, back and bi's, 30 minutes of cardio. I wanted more, I needed more. When stumbling across a video one day I thought to myself, "well man... that looks like fun!" The next day I found the closest box to me and dropped in for a workout. I was hooked! There wasn't much about the experience that I didn't like. I enjoyed being face down on the concrete, head in arms, gasping for air and drenched in sweat. I loved looking over and seeing my fellow athletes destroyed along with me. About a year later I realized how involved I already was and how dedicated I had become and decided to get my L1 . Helping the everyday person begin to realize their capability and test their limits on a daily basis made me fall more in love with the sport that I had already come to enjoy. When people ask me "What is Crossfit?" I can never explain it to them. I always have to tell them to just come check it out. No, we're not all world class athletes. No, we do not flip tires every day. If you want a community that will cheer you on, suffer with you, grind with you, and shine with you, then Crossfit is your answer. I love this sport and everything it has done for me. I hope I can be apart of doing the same for you! When I began my CrossFit journey in December of 2011 I had no clue what kind of impact it would have on my life. It immediately took up all of my time and I just couldn't wait for the next day to come so I could head back to the box. Not only did I start to see changes in my body, but I could see changes in my overall behavior. I was more positive, patient, and calm with every day normal problems. That was when I realized I had to become a coach so that I could spread this amazing joy which had taken over my life. It's so inspirational to see "everyday normal people" come in day in and day out and just work hard to reach their goals. CrossFit will always be a part of my life in some way or form, and that's okay by me! ​For me CrossFit started in the summer of 2011. I had just graduated from Texas State University and was preparing to enter active duty with the US Army. I happened to find the CrossFit Games on ESPN and was extremely interested in learning more about the sport of fitness. I found a Level 1 coach and began my first experience with Crossfit as an athlete. From then on, I was hooked. I immediately saw significant improvements in not only my strength and conditioning, but also the trials of learning new skills and lifts, and the challenges of trying to master all things CrossFit. These were the first steps of my CrossFit journey. After getting back from Afghanistan, I took another step and made the decision to attend a CFL1 Seminar to become a coach. I passed my Level 1 test in November of 2013. 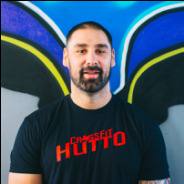 I have been coaching Crossfit on and off since 2013 and have been coaching at CrossFit Hutto since April of 2017. The thing I enjoy most about coaching at CrossFit Hutto has to be the community of athletes we have at the Box! Also, being apart of the great team of coaches that get to help our athletes accomplish something new each day! ​I first found Crossfit in April of 2015 through a friend and coworker. I had recently given birth to our second child and was desperately searching for the motivation to get myself back in shape. Crossfit offered the perfect environment of a great workout, all modified to my own abilities, individually guided coaching, yet all within the comfort of a community of others just like myself. Everything about Crossfit had me hooked from the start and after eight years of restaurant management, I knew this was my true passion. I became a CFL1 in November of 2017 to continue my learning and to be able to help others find their motivation and be better versions of themselves, just as it had done for me. I moved to Texas with my husband and two children in late 2017 and am excited to continue this journey in life. My goal is to learn something new and be better every day so I can share my knowledge with those that I serve.